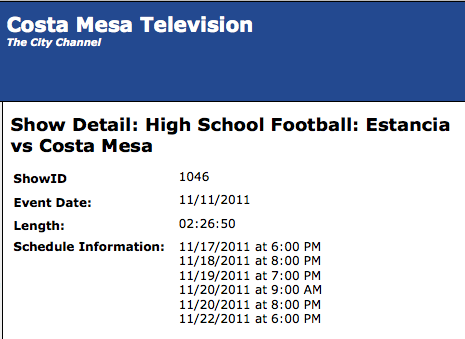 Our friends, Dane Bora and Brad Long of Costa Mesa Television, have released the coverage of the epic "Battle of the Bell" football game between Estancia and Costa Mesa high schools that was played on Friday, November 11, 2011. Their coverage of the game, plus some bonus footage of halftime activities provided by each high school, is now up and available for viewing on Channel 24 (Time Warner Cable) and Channel 99 (ATT U-verse) beginning at 6:00 p.m. this evening and subsequently on the following schedule. Additionally, it will also be available on streaming video next week, but we don't know exactly when. To check to see if it's available go to the City site, HERE, then scroll down to High School Sports until you see that image, below. The game will appear under that tab once it's available. Thanks to Dane and Brad for this great effort to cover this wonderful event. 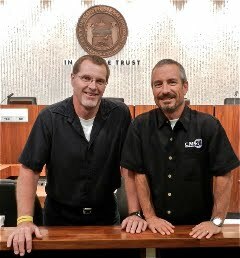 These guys are an asset to our City. Well done, again.